Fredericksburg is a confusing park, but the National Park Service has done wonders with what is a battlefield in the middle of a town. Use Route 3 and follow the signs to get to Park Headquarters, which is located just below the stone wall on Marye's Hill. The Park consists of the area covered by the famous stone wall, Marye's Hill and the battle line south of the city to Hamilton's Crossing, which was occupied by Jackson's forces. Due to the encroachment of houses right up to the stone wall, you'll have to use your imagination to get the full impact of the site. The wall is mostly reconstructed, however there is a portion of the original stone wall further down the road. 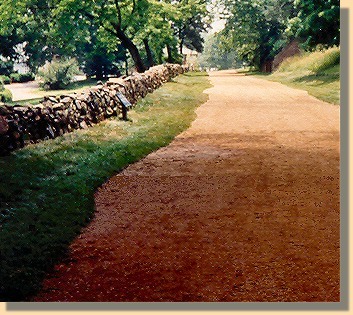 The sunken road, behind the stone wall, is now a paved road and still in use. A fence has been erected between it and the wall in order to keep tourists from getting run over. There are excellent signs (some with audio) to tell you what you are looking at. Riding down the Park road along the Southern battle lines you can stop at Lee's hill and climb up to where Lee observed the battle (Not a bad climb). We were amazed how much different today's view from Lee's Hill is from when he was there. The culprits are, of course, the trees and developments. At the end of the road, you come to the position from which Stonewall Jackson observed his portion of the battle. With a little imagination you can also locate where Major Pelham, starting with two cannon, and ending with one, held off a full Union Corps for over an hour. Finally, in the distance you can see a huge stone triangle constructed by the Southerners to mark the point where Union forces broke through Jackson's line, temporarily. Now, why that is marked by the South is beyond me, or maybe we are mistaken. Fredericksburg is only ten or so miles from Chancellorsville (and the Wilderness) on Route 3. So you can see a lot of history with very little travel. Copyright 1997 - 2012 by USA Civil War.com.